Carryings On Up The Dale: My new Man Cave takes shape. My new Man Cave takes shape. Work started on our 'new' place in late July. The house we're moving into has been literally gutted and is having new heating, electrics, plumbing and numerous other improvements made, such as a bigger kitchen, bigger conservatory/sun room, a new garage for Katherine's MGB, and a new Man Cave, as seen above. 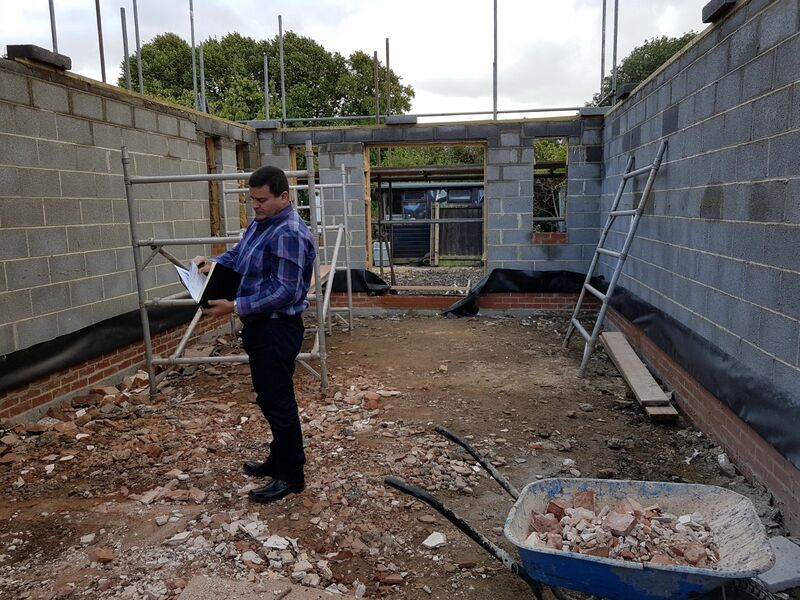 The photo was taken from the doorway into the room and looks down towards the garden end with French windows which will open out onto a patio area and eventually a hot tub! The roof will have several large skylights so there will be plenty of natural lighting. The 'cave' is 22' x 15' so there will be masses of room for a large table, (probably 15' x 6' with 'deployment areas' running along each of the long walls), storage for all my figures, plenty of wall space for my paintings and bookcases, and a paint station at the far end. good luck on the renovations and I hope the new house works out for you both. It sounds wonderful. And your man cave will be incredible. Thanks Mark. I can't wait. Looks wonderful Colin - sounds like this will be perfect gaming paradise. Exciting news! I can almost see the finished room in my mind's eye. Imagine how much fun it will be to unpack, arrange, and set up your gear in the new War Room. And listen to good music, with a nice G and T, while painting some figures that are not really required. Not sure about the G&T old chap. I find that Pimms improves my painting! I'm betting you can't wait to get it all up and running! Congratulations on your bespoke man cave. It's nice to be able to design it to your own requirements. Who gets an invite to the grand opening then? Paul there will of course be an inaugural game to which you will be invited. Make sure you have a ribbon cutting ceremony and take pictures of the inaugural event. with a sand table even? So how big is the new wargame table going to be ? If it bigger does that mean you have to buy more figures to put on it. Mark, I'm sure you know I could cover my existing table several layers deep in figures already! It'll be 15' x 6' with rear 'deployment areas' on the walls along the long axis. Good luck with it all Colin. Having done something similar I know it is both exciting and a lot of work. I have similar measurements but only for half the room so I envy your full length version. Be sure to save plenty of wall space for even more paintings, or spill out into the rest of the house with them.... Having given up a sand table after many years partly because it is heavy work I would caution against for someone with a back problem, unless you have some little elves to shift the wet sand according to your direction. thanks Chris. I agree a sand table id's not a good idea in my case especially as I have my elves working overtime on other projects 😉 I must also make my mind up about a new painting from your good self. Fantastic Colin, but a word of caution . . . I thought my games room was going to be PLENTY big enough, but within 2 years I was running out of space. Hope you've got room for a future extension! (Either that or evict the MGB and do a land-grab, although I'd imagine that wouldn't go down too well!) Looking forward to seeing the finished article.